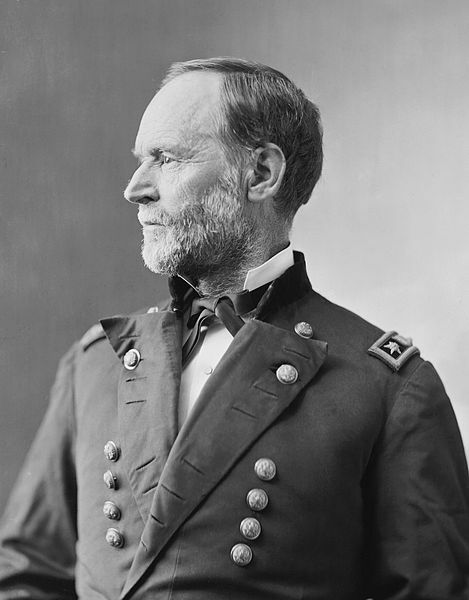 William Tecumseh Sherman was born in Lancaster, Ohio, on 8 February 1820. When his father died, Thomas Ewing adopted him. Sherman attended the United States Military Academy, graduating in 1840. Upon graduation, he was commissioned as a second lieutenant and assigned to the 3d Cavalry in Florida. In 1841, he was promoted to first lieutenant. During the Mexican War, Sherman served in California as an aide to Generals Stephen W. Kearney, Persifor F. Smith, and Richard B. Mason. In 1850, he married Ellen Ewing, was made a captain and posted to Saint Louis and then New Orleans. Sherman resigned from the Army in 1853 to pursue ventures in banking and law. In 1859, he became the superintendent of a military college in Alexandria, Louisiana. When the Civil War started, Sherman rejoined the Army as a colonel. He was soon made a brigadier general of volunteers and fought at Bull Run in July 1861. Sherman was then sent out west to command the Department of the Cumberland. He was wounded at Shiloh. He led forces in Tennessee and Mississippi. At Vicksburg, he commanded XV Corps and was made a brigadier general in the Regular Army. In August 1864, he was promoted to major general. He commanded the Division of the Mississippi on his “March to the Sea” through Georgia in late 1864. In 1865, he led the Armies of the Ohio, Tennessee and Georgia in the final operations of the South, receiving the Confederate Southern forces’ surrender in April 1865. In 1866, he was promoted to lieutenant general and became a full general in 1869. Sherman was the commanding general of the United States Army from 8 March 1869 to 25 October 1883. As the commanding general, Sherman sought to establish senior officer control over the bureau heads and urged consolidation of troops at strategic locations. He established schools for infantry and cavalry. Sherman retired from the Army in 1884 and died in New York City, on 14 February 1891.